After suicide bombings took place outside the gates of the Stade de France while France and Germany competed in an exhibition match Friday night, and a stadium was evacuated due to threats of explosives in Germany on Tuesday night, it would be completely understandable for soccer players and fans alike to be scared. 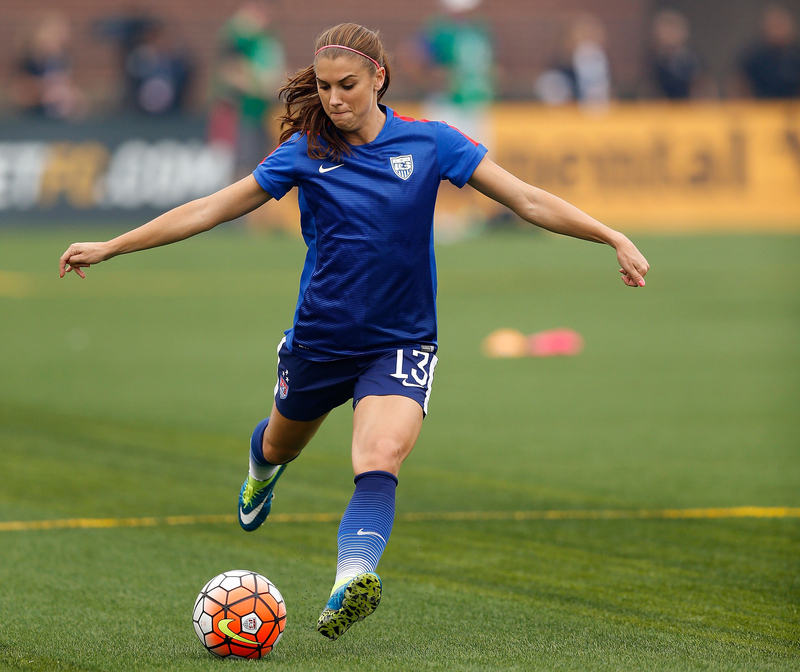 Despite the violence, one United States Women's National Team (USWNT) player, Alex Morgan, won't stop playing soccer. The World Cup champion doesn't think that soccer will tear people apart, but will actually have the opposite effect and act as a way for people to come together. "I don't think soccer should ever make anyone afraid to go out and play," Morgan told TMZ. "I think it brings the world together. It's really unfortunate what's going on around the world, having to close down games and all that, but no, I don’t think [I'm afraid]." Morgan added that she believes fans will still come to games despite the attacks, saying: "I don’t think that it'll scare people. I think [the tragedy] is bringing the world together, if anything." The Islamic State's violence isn't going to stop her from playing the game she loves, or keep her fans from cheering her on. When three suicide bombers detonated explosive vests outside the Stade de France, killing themselves and one civilian, people inside the stadium didn't know about the attacks, or the others across the city. At least one of the bombers tried to enter the stadium, but security discovered his vest when he was frisked at the entrance. The attacker then set off the bomb as he tried to back away from the guards. A few minutes later, a second bomber set off his vest outside the stadium. Then, the third bomber detonated his at a nearby McDonald's. On Tuesday, a Netherlands-Germany game was canceled and the stadium in Hannover, Germany evacuated after officials received two tips about "serious plans for explosions." However, regional Interior Minister Boris Pistorius said at a news conference Tuesday night that no explosives were found at the stadium. In the wake of these two incidents, an exhibition match between France and England Tuesday night acted as a display of solidarity, just as Morgan believes soccer can be. Before the game started, both teams' coaches joined Prince William to lay flowers on the sideline in remembrance of the victims of the Paris attacks. And when the teams' national anthems were played, the entire stadium stood and sang along to "La Marseillaise," the French anthem. Soccer is already bringing the world together, despite terrorist threats against the sports' players and fans.